Michel Roux Jr’s refreshing frozen berry soufflés are the perfect summer dinner party dessert. Hull the berries (if necessary), then wash and put in a blender or food processor with 75g of the sugar. Whizz until smooth, then pass through a fine sieve (discard the seeds/skins). Taste the purée – it might need a squeeze of lemon juice to boost it. Prepare 6 ramekins by tying a strip of baking paper around the outside to form a collar about 5cm above the rim. Put the egg whites into an electric mixer (or in a large mixing bowl). In a clean saucepan, dissolve the remaining 125g sugar in 250ml water over a low heat. When the sugar has completely dissolved, bring the water to the boil, skim off any foam and cook to 120°C (use a digital probe thermometer or sugar thermometer to check). Remove the syrup from the heat once it reaches this temperature. Working quickly, using an electric mixer, beat the egg whites until foamy. With the mixer still running, pour the hot sugar syrup directly onto the egg whites at the edge of the bowl – make sure the hot syrup doesn’t drop onto the beaters as you pour it in (it will solidify onto them). The egg whites will start to whip into a stiff meringue mixture. Continue beating until the meringue has cooled (you’ll be able to feel it from touching the bowl). In a separate mixing bowl, whip the cream with a balloon whisk until it forms soft peaks when the whisk is removed, then fold into the fruit pulp using the whisk or a metal spoon. Gently fold the fruit mixture into the meringue, then spoon the mixture into the prepared ramekins. Freeze the soufflés for at least 12 hours (see make ahead). Remove from the freezer 10-15 minutes before serving so they soften slightly. Remove the collars, top with whole berries and/or sliced strawberries, dust with icing sugar (if you like), then serve. If you only have large ramekins, you can still make the soufflés in those, but they won’t come over the top of the rims so there’s no need to tie baking paper collars onto them in step 1. You can make the puddings up to 1 week in advance. Keep wrapped and frozen until ready to use. 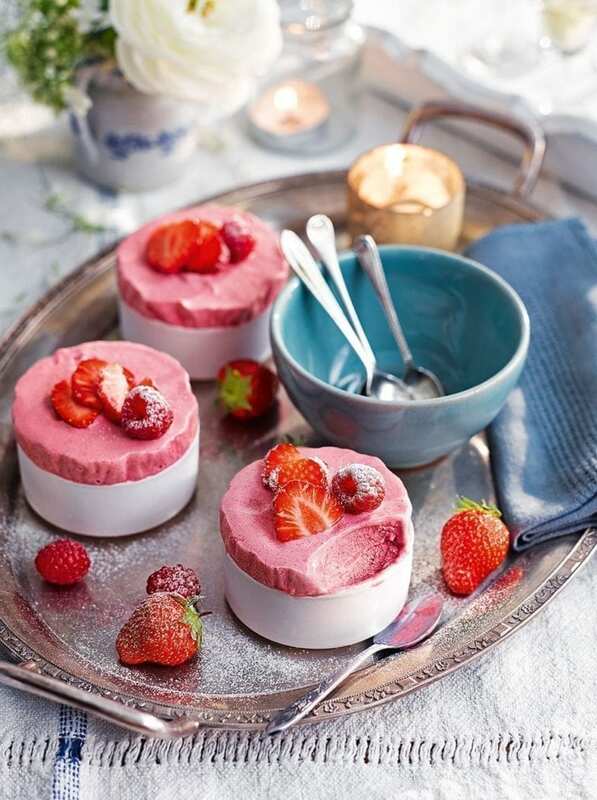 Iced soufflés get their look – and name – from being overfilled, then frozen with a baking paper collar around the ramekin. They look like soufflés but they’re really frozen mousses, so there’s no danger of them sinking.